Brandon Dermatology is pleased to announce Dr. Ricardo L. Berrios ,who recently joined the practice. A native of Brandon, Dr. Berrios received his Bachelor’s from the University of South Florida, where he majored in Biomedical Sciences and graduated with highest honors. He graduated with honors from Emory University School of Medicine in Atlanta, Ga. remaining there for his internship in Internal Medicine. He went on to complete a post-doctoral fellowship under the mentorship of Dr. Jack Arbiser in the Department of Dermatology at Emory. Brandon Dermatology is located at 405 W Bloomingdale Ave. in Brandon. Call 662-3376 or visit brandondermatol ogy.com. Delaney Creek’s Seventh Annual Health Fair will be Wednesday, October 29 from 9 a.m.–2 p.m. Set up time begins at 8 a.m. with a $25 table fee to be used toward door prizes. Help support the American Cancer Society by purchasing lunch for $3 which includes a hotdog, chips and a drink. Reservations can be made by calling 655-8858. Delaney Creek is located at 320 S. Lakewood Dr. in Brandon. Brandon Regional Hospital was recently honored at the Women’s Center by the American College of Obstetricians and Gynecologists (ACOG) District XII (Florida) and the March of Dimes for reducing the number of elective inductions and cesarean deliveries with a special recognition banner. The hospital recently met the criteria to qualify for this distinction, which includes achieving a rate for elective deliveries for 39 completed weeks of pregnancy of five percent or lower and that they have policies in place to prevent such deliveries. It is located at 119 Oakfield Dr. in Brandon. Call 571-5105 or visit BrandonRegionalHospital.com. The Greater Brandon Chamber of Commerce (GBCC) is hosting Eastern Hillsborough County’s premier election Hob Nob that will include opportunities for citizens to visit one-on-one with candidates. The event takes place Tuesday, September 16 at The Regent located at 6437 Watson Rd. in Riverview. All attendees will be able to vote for their favorite candidates in the Hob Nob Straw Poll. Heavy hors d’oeuvres with cash bar will be available. Student tickets are only $10. Chamber member tickets are $20. Community member tickets are $25. All at-the-door ticket purchases are $30. Tickets may be purchased online at www.brandonchamber.com or by calling 689-1221. GBCC member candidates’ admissions are $250 ($300 for non-member campaigns). To register for candidate campaign space, contact Laura Simpson at 689-1221 ext. 8821 or e-mail lsimpson @bran donchamber.com. The last Friday of each month is the Rolling Pin’s “A Taste of … ” food and wine pairing event. The menu features foods and wines of different countries or regions from around the globe. Chef Dave West and Wine Specialist Marc Wagner will discuss each course’s pairings. The next event is Friday, August 29 from 6:30-8:30 p.m. The menu will include Nicoise toasts, pizza with Fontina potatoes and Tapenade, Coq au Vin simplified and French lemon tart. Receive 10 percent discount on all retail merchandise on day of class. The cost of the class is $45. To register, visit rollingpinonline.com or call 653-5418. Rolling Pin Kitchen Emporium is located at 2080 Badlands Dr. in Brandon. Nominations are now being accepted for the Greater Hillsborough County Fair’s annual Harvest Awards to be presented Thursday, October 23 at the County Fairgrounds. Deadline for nominations is Friday, September 5. The annual Harvest Awards Luncheon allows the community to recognize individuals, organizations, corporations and other entities that have made significant contributions to the fabric of Hillsborough County. Nomination categories are: Farm Family of the Year; Urban Agriculturalist; Outstanding Public & Community Service, Agribusiness of the Year; and Lifetime Achievement Award. Online nominations may be submitted via hillsboroughcountyfair.com/nom ination.html. Printed forms may be scanned in an e-mail to hillsboroughcountyfair@verizon.net, by fax to 737-4889 or traditional mail to Hillsborough County Fair, P.O. Box 100, Sydney, FL 33587. Call 737-4247 or visit www.hillsboroughcountyfair.com. 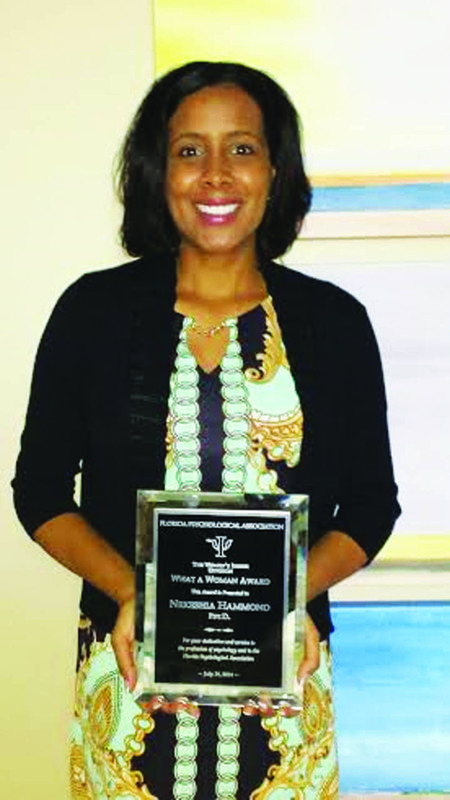 Dr. Nekeshia Hammond was awarded with the Florida Psychological Association’s (FPA) “What a Woman Award” in July at the FPA Convention and awards ceremony. This prestigious honor is only awarded to a psychologist who has made significant contributions to the Florida Psychological Association and to the field of psychology. Dr. Hammond has been a member of the Florida Psychological Association’s Bay Chapter since 2008. Dr. Hammond is the owner of Hammond Psychology & Associates, P.A., a private practice working with children, teens, families and adults on an array of clinical issues. 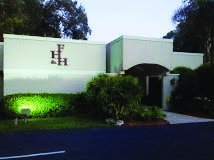 Hammond Psychology & Associates is located at 710 Oakfield Dr., Ste. 102 in Brandon. Call 567-3253 or visit hammondpsycholo gy.com. Sara James Salon is proud to announce its community partnership with Emergency Care Help Organization (ECHO) and Lost Angels. Sara James Salon is directly supporting ECHO’s ‘Back to Work’ program by providing hair services for 10 candidates who are ready to reenter the job market. Lost Angels is a no-kill animal rescue organization that relies on community support to help furry friends. Sara James Salon will ‘Sponsor a Dog’ that resides in a ‘forever’ foster home. Sara James Salon is located at 106 E. Bloomingdale Ave. in Brandon and can be contacted at 654-6594. The Greater Brandon Chamber of Commerce congratulates the area businesses that have been named 2014 Small Business of the Year Award semi-finalists. This Awards Gala honors small businesses within the Brandon area that have demonstrated leadership, positive growth and development, creativity and integrity in operating a business, as well as a commitment to community services. Award categories include: 1-5 Employees, 6-15 Employees, 16 Plus Employees, and Home-Based Business. The Greater Brandon Chamber of Commerce’s 2014 Small Business of the Year Award Gala Title Sponsor is The Bank of Tampa-Brandon Division. Additional sponsors include Tampa Bay Times, Sencommunications, Inc., Sheraton Tampa East Hotel, Fancy That Specialty Linens, Simmons Engraving, and Carr Pediatric Dentistry. The event will be held Thursday, October 23 at the Sheraton Tampa East Hotel. Congratulations to the semi-finalists: 1-5 Employees: Savage Consulting, Inc.; Julie’s Walk-In Closet; Moon Law Group; Hough Financial Services and Dynavistics, Inc.; 6-15 Employees: Atlas Professional Services; Republic Voice & Data; Affordable Lock & Security; HiTech Automotive and Pilka & Associates, P.A. ; 16 Plus Employees: Livingstone Academy; Suncoast Community Health Centers; Delaney Creek Lodge; Immaculate Janitorial Services, LLC; and Zaxby’s; Home Based Businesses: The Waiting Game Publication; Campbell Real Estate, Inc.; ION Apparel & Advertising Specialties; Mackey Productions, LLC; and Yard Guards on Doody, LLC. Professional Ballet Company Brandon Ballet is currently seeking new board members. The Brandon Ballet is governed by an active volunteer board of directors who are committed to the vision, goals and objectives of the Brandon Ballet Company. Brandon Ballet offers high-quality, classical ballet training, and performs two major, full-length ballets each season. As the company celebrates its 21st anniversary, it hopes to add new members to its Board who are connected to Brandon Ballet via association with a dancer, as well as those who have no connection and can bring unique skill sets, access to grant monies, perspective on other arts/not-for-profit organizations, or educational expertise. Board meetings are usually held the first Wednesday of the month at 6:30 p.m. For more information, e-mail dance@brandonballet.org or call 684-4282. Brandon Ballet is located at 161 E. Bloomingdale Ave. in Brandon. Ferraro Hayes, an accounting firm and financial solutions provider in Brandon, announced this week that Ferraro, Higginbotham & Hayes has officially changed its name to Ferraro Hayes. Ferraro, Higginbotham & Hayes has recently undertaken an extensive rebranding effort of its divisions and is now marketing with one name — Ferraro Hayes. A new logo and Website has been created, which is now part of Ferraro Hayes’ corporate identity. Ferraro Hayes, P.A., CPA’s provides professional accounting and consulting services to Tampa Bay. Ferraro Hayes maintains a reputation of excellence by providing clients with the highest quality of professional service. It is located at 217 Lithia Pinecrest Rd. in Brandon. Visit www.ferrarohayes.com or call 689-7153. Frank Hall, Owner/Operator of Jetstream Pressure Washing of West Central Florida, is excited to offer pressure washing, roof cleaning and paver sealing services to the Brandon, Valrico, Riverview, FishHawk and Plant City areas as of Thursday, August 28. Jetstream Pressure Washing boasts attention to detail, fair pricing, thorough knowledge of its business, and customer service. For more information, call 438-9211 or visit www.Jetstreampw.com. Tampa Bay Neurosurgery & Spine Specialists, formerly known as Henkin Neurosurgery, is proud to announce the addition of the newest Neurosurgeon to its team, Tien V. Le, M.D. Joining the practice this month, Dr. Le brings his unique skill set and expertise in advanced Minimally Invasive Spine Surgery and Neurosurgery. He joins Philip Henkin, M.D., Board-certified neurosurgeon, to create the newly formed Tampa Bay Neurosurgery & Spine Specialists. Dr. Le is now accepting new patients at Tampa Bay Neurosurgery & Spine Specialists, located at 1007 Professional Park Dr. in Brandon. Call 651-3300. 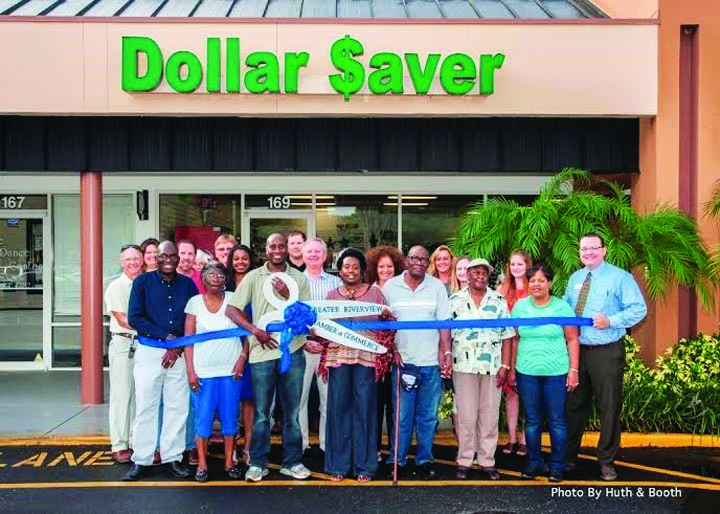 In July Kathleen Sampson of Dollar $aver invited the Greater Riverview Chamber of Commerce to conduct a ribbon cutting ceremony to celebrate its recent opening at 169 Bloomingdale Ave. in Brandon. Customers can buy anything from candy and cards to jewelry and home décor. Hours are 10 a.m.–6 p.m. Monday – Saturday. Visit www.facebook.com/pages /Dollar-aver/475556079219637 ?sk=timeline. 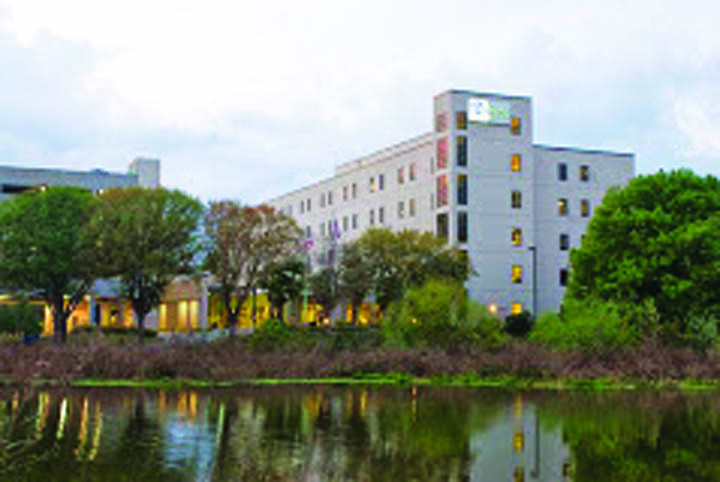 Jersey College, a private post-secondary institution with Florida campuses located in Tampa, Jacksonville, and Ft. Lauderdale, held its grand opening ceremony for its new 40,000 sq. ft. facility at 3625 Queen Palm Dr. in Tampa in July. The Simulation Center at Jersey College has been dedicated in memory of Cheryl Goforth, RN – former Chief Nursing Officer at Brandon Regional Hospital and Northside Hospital in St. Petersburg. Goforth was passionate about nursing and expanding nursing education in the Tampa area. Call 344-4020 or visit www.jerseycollege.edu. Ibiley Uniforms and More has been serving parents, teachers and students for over 25 years and is happy to announce its new location in Brandon. It focuses on four things: quality, comfort, convenience and pricing. It is a one-stop shop for bottoms and tops at reasonable prices and carries inventory year round. The flagship Ibiley Premium Line tops and bottoms have an enduring quality that is guaranteed to last up to 50 washes. Ibiley Uniforms and More are located at 529 W. Brandon Blvd. in Brandon. Call 305-625-8050. 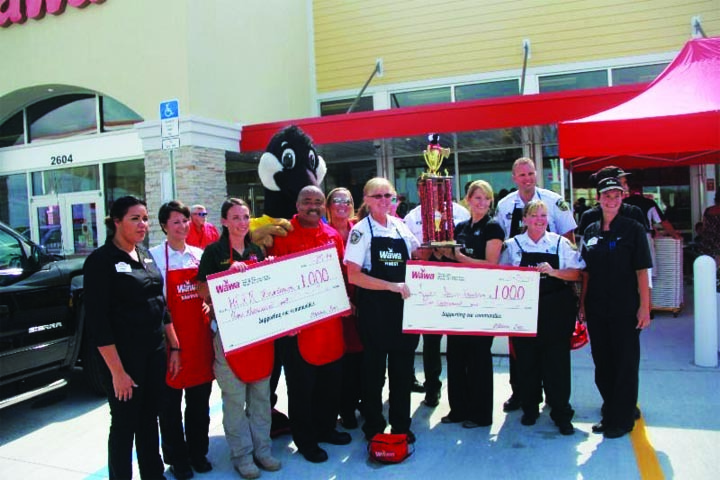 Store hours are Monday to Friday from 10 a.m.-6 p.m. and Saturday from 10 a.m.-5 p.m.
WaWa held a grand opening ceremony in July at its location at 2604 S. U.S. Hwy. 301 in Tampa. A team representing Hillsborough County Fire Rescue competed against a team from The Hillsborough County Sheriff’s Office building sandwiches. HCSO won the competition and both teams received a donation of $1,000 to the charity of its choice. Hillsborough County Fire Rescue Foundation was the recipient of this donation. Visit www.wawa.com.